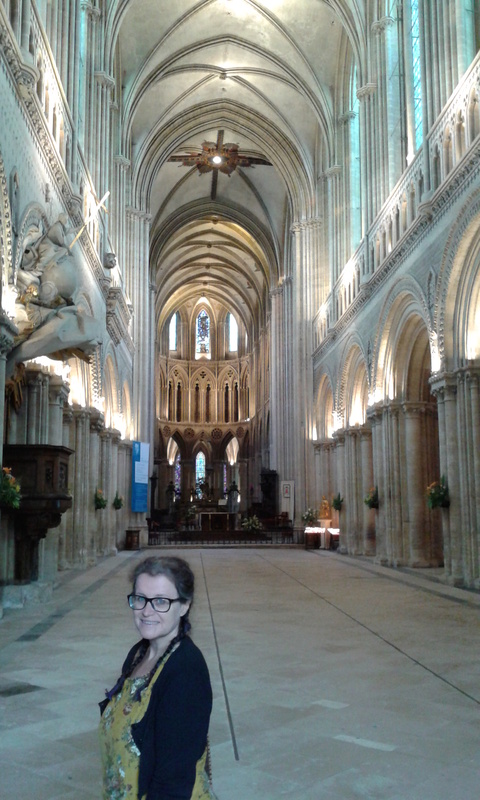 Trouvere at Large Summer 2014 – Final episode: Bayeux! 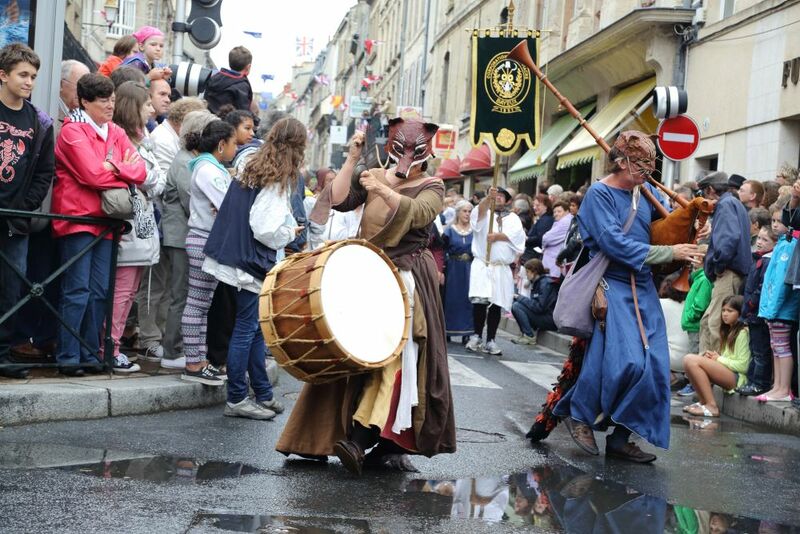 Our last weekend in France was spent performing at the Fêtes Médiévales at Bayeux. 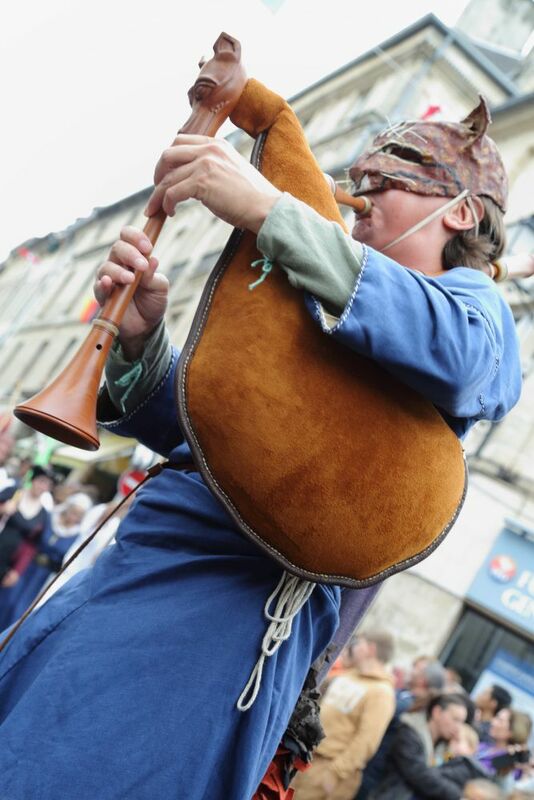 It was our second time at the festival as performers and our third time in all – our first time was as visitors, when we were massively impressed with the whole thing! 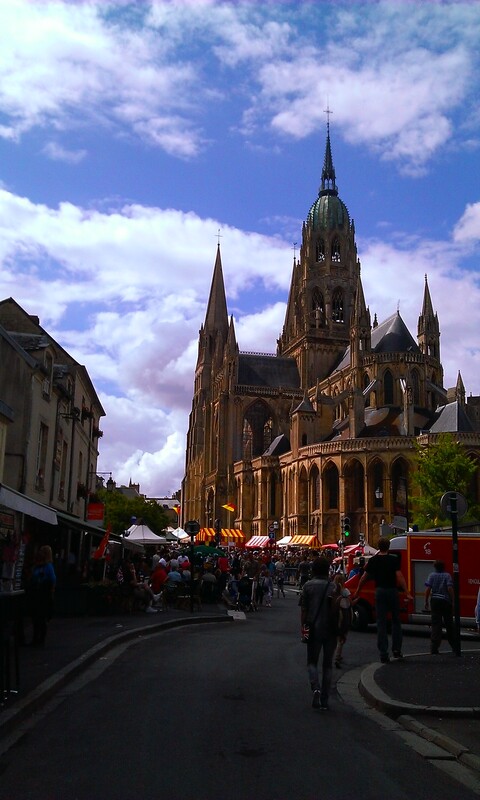 Bayeux is a great place for a medieval festival – it’s not too big, there’s a good campsite a short walk from the centre, the centre is dominated by an utterly magnificent medieval cathedral with several other nice medieval buildings close at hand, and of course the town possesses an iconic medieval relic in the Tapestry. 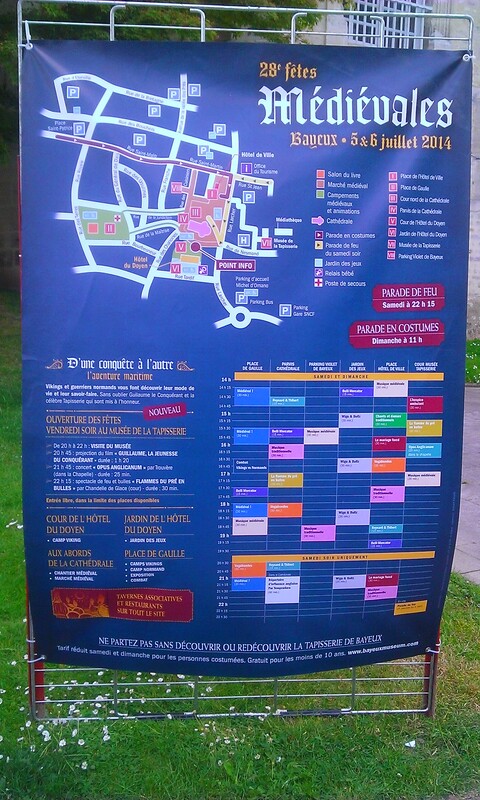 Every year on the first weekend in July, the entire centre is taken over with the Fêtes. Market stalls huddle all about the Cathedral, and the streets – which are generally thronged with people – are packed with entertainments. The cathedral is thrown open all day and into the evening, with extra events taking place inside, and on the Sunday morning there is a massive parade of all participants which draws simple huge crowds. For the first time (I think) this year, the Tapestry Museum was a major venue, and (certainly for the first time) there were events there on the Friday night, in which we played a part. There were two elements to our involvement at the Festival. 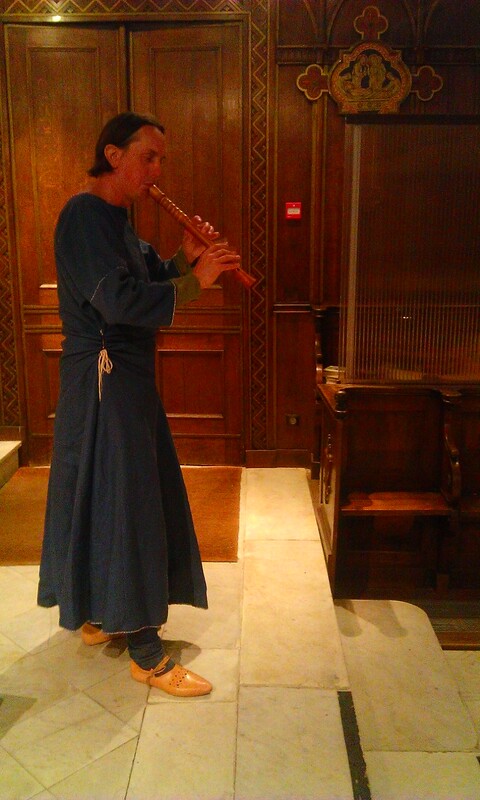 Firstly, we were presenting a short programme of English medieval music in the chapel of the Tapestry Museum – this happened on the Friday evening and on both Saturday and Sunday afternoons. Then – in complete contrast! 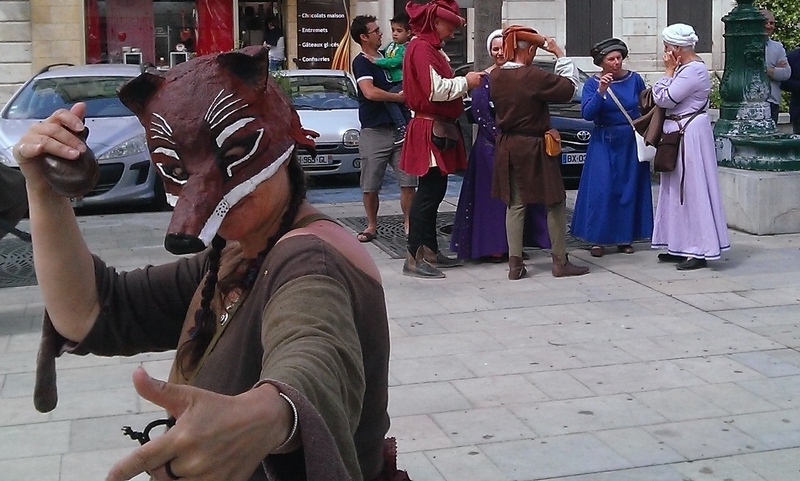 – we were presenting masked mimed foolishness in the guise of Reynard the Fox and Tibert the Cat. 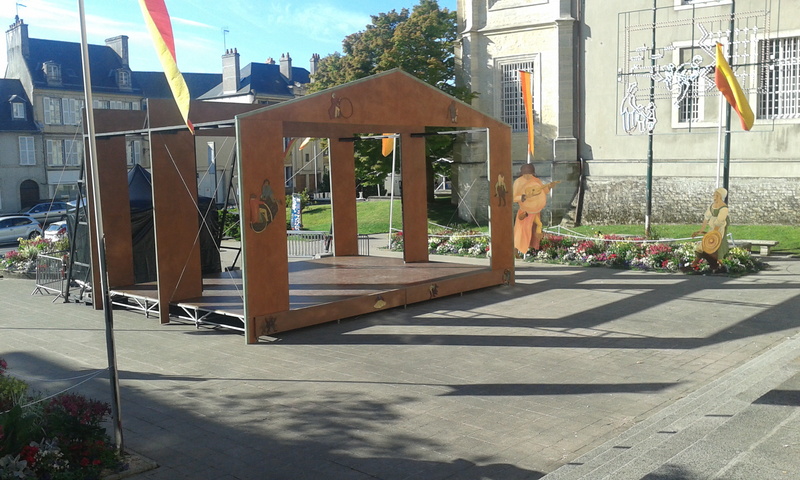 We had three of these shows on the Saturday – two outside the western doors of the cathedral (an established performance space for the festival) and one on the stage in front of the Hôtel de Ville – the biggest performance area of the festival. And two of these shows on the Sunday. So we had a busy programme right through the weekend. 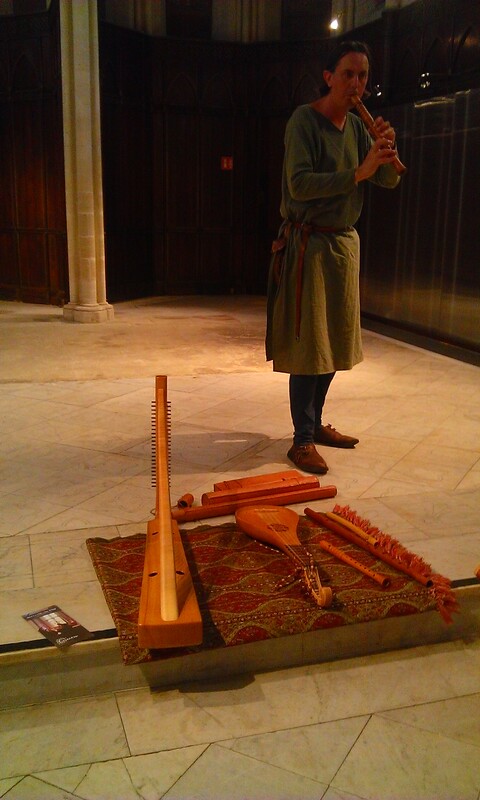 The performances in the Tapestry Museum chapel were quite special – it is a thirteenth century space and the only surviving element of the earlier medieval abbey which was rebuilt in the eighteenth century and done away with at the time of the Revolution. We had excellent attendance at all three performances and our music suited the space really well. Our programme travelled from a pre-conquest antiphon through to the fifteenth century ‘There is no Rose’, with St Godric’s ‘Sainte Nicholas’, ‘Parti de Mal’, ‘Ja nus hons pris’, a Ductia, ‘Verbum patria humanatur’, ‘Miri it is’, ‘The Song of the Nuns of Chester’ and ‘Brid one brere’ in between. I managed to introduce everything in passable French, and Paul managed to chat in French about the instruments to interested parties at the end of each show. All in all, we very much enjoyed doing these short concerts – it was a real treat for us. 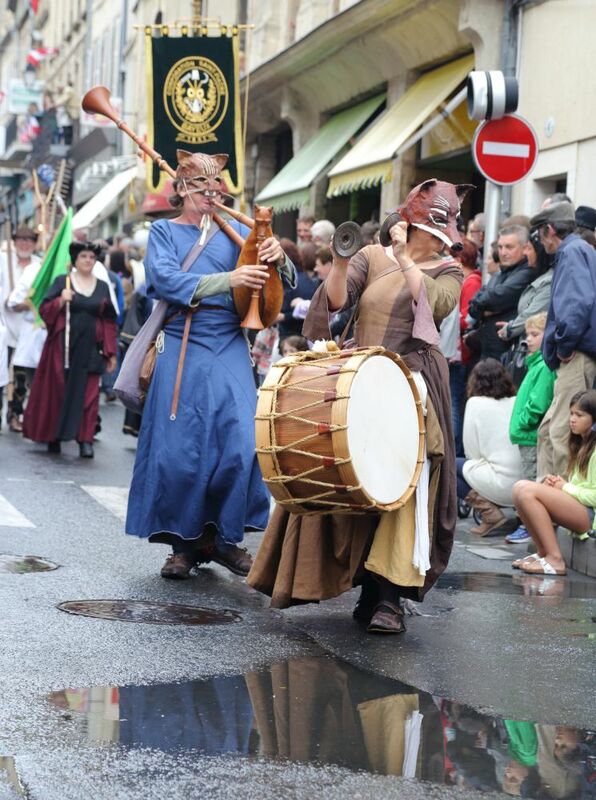 Finally we should mention the parade on the Sunday morning. 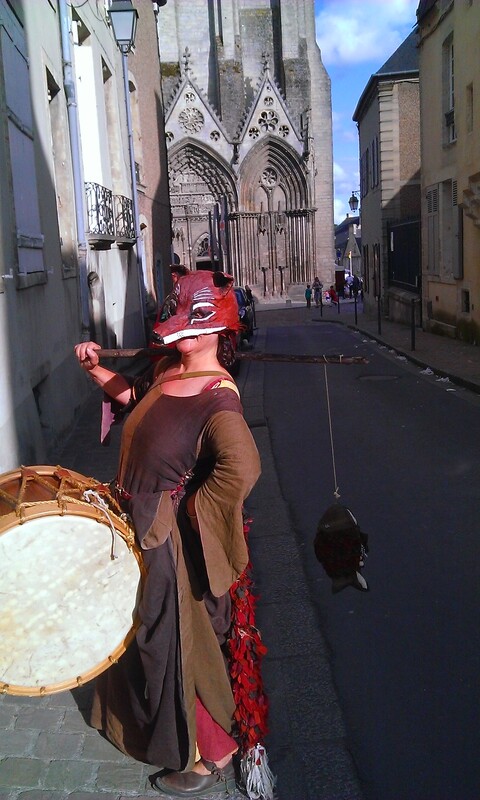 The weather was still making its mind up what to do and we weren’t sure whether to wear our masks or not – but in the end we went for it and were glad we did as the rain disappeared and we were able to prance our way happily down the streets in fox and cat mode. We got a lovely reception as ever, and thanks to Stephen and Helen Jones for once again taking some amazing images of us prowling away. And so we returned to England with much improved French (let’s hope it lasts) and a new instrument or two, and a lot of great memories. 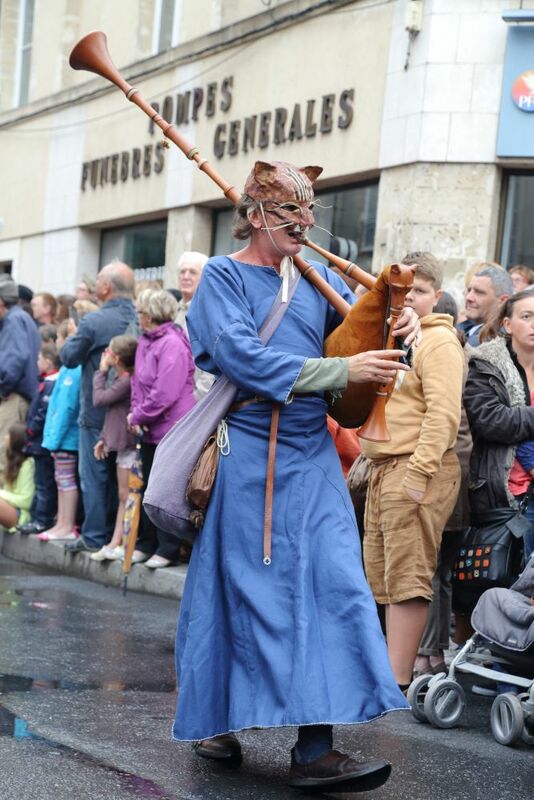 We really hope to get back to France again next year to meet familiar faces and make more new friends, and to experience some more of those amazing French fêtes! 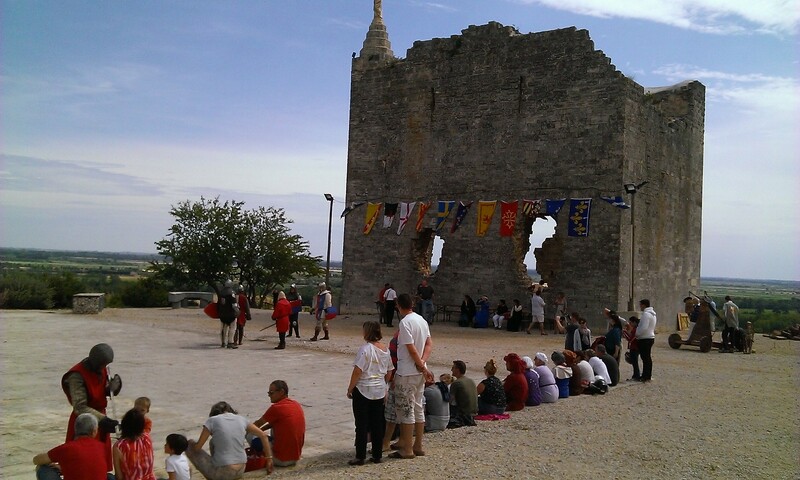 Bellegarde is a small town in the Gard region of the Languedoc, roughly half-way between Nimes and Arles. 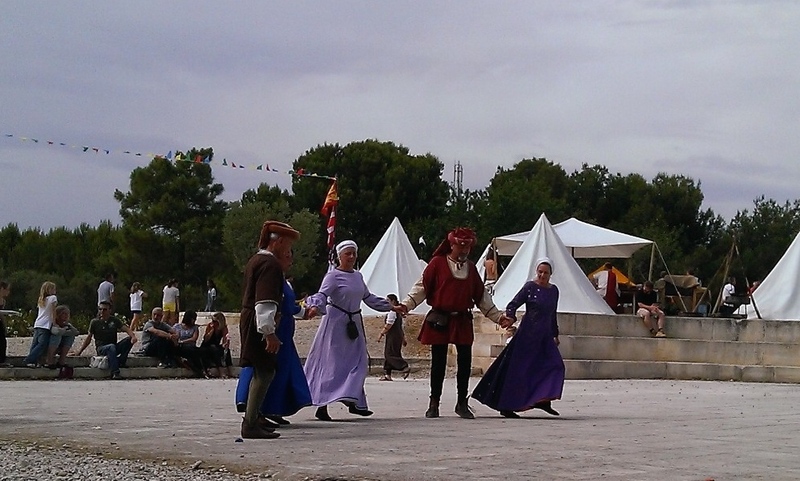 We went to take part in their Fêtes Médiévales, having enjoyed a few days on the Mediterranean coast after our exploits at Puivert. 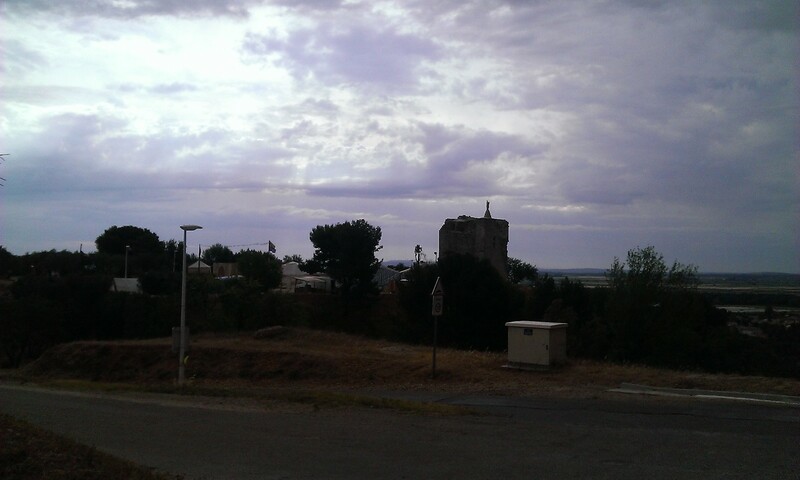 The town lies below a substantial hill, crowned with the chunky remains of a twelfth-century tower, named ‘La Madone’ after its statue of the Virgin. The area around the La Madone has been (and is being) landscaped and has a lovely large performance area with seating around. 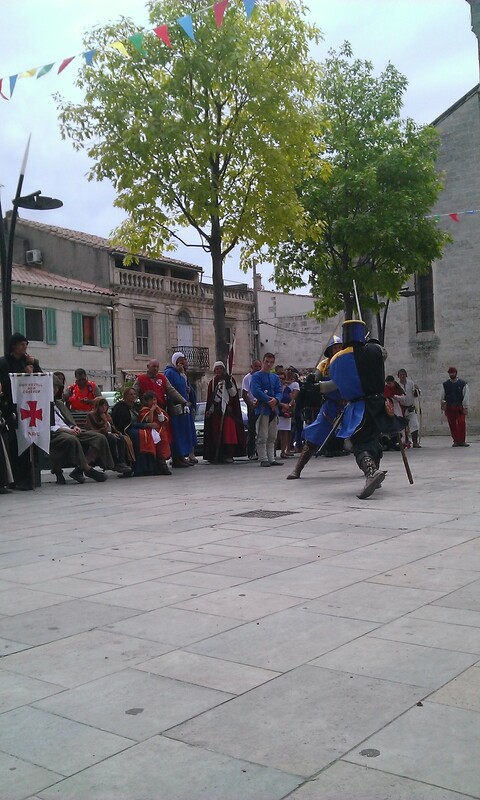 This was the main venue for the Fêtes, but there was also a daily parade down into the town and back again. 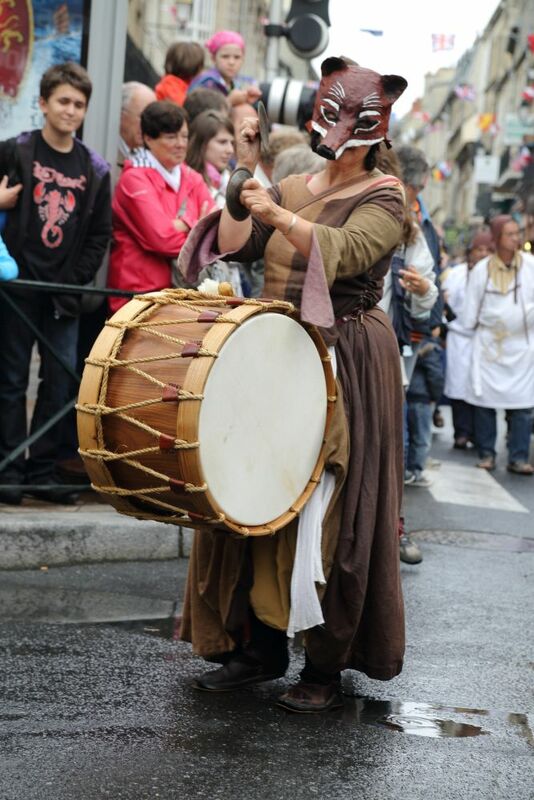 The parades into and out of town were fun – we made our way to the church in the middle of the town and different groups took it in turns to entertain the assembled good people of Bellegarde, with fights, dances, music, and so on. 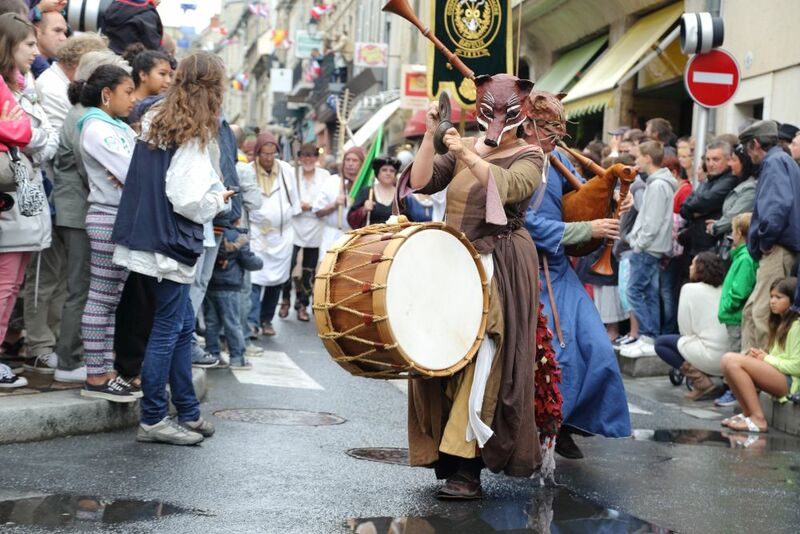 And we contributed our bit by joining in with the music in our guise of Reynard and Tibert. I particularly enjoyed their version of Arbeau’s ‘Scottish Branles’, which had real pace and energy. Saturday was a bit quiet at the Fêtes, although the evening feast was very well attended, but Sunday was much busier, and the weather improved as well. We had been pounded with rain on Friday night and on Saturday night too there was more rain and powerful winds too. However, Sunday afternoon turned baking hot, and we had to make the most of the shade provided by La Madone as we played for the dancers – who had no such shelter!